Gazala Siddiqui, MD, is board certified in both female pelvic medicine and reconstructive surgery and obstetrics and gynecology. 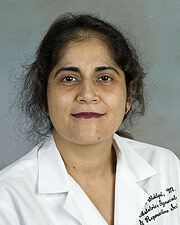 Upon earning her medical degree from J. N. M. Medical College in Raipur, India, Dr. Siddiqui completed a residency in Obstetrics and Gynecology at Mount Sinai Hospital and Medical Center in Chicago and a fellowship in Female Pelvic Medicine & Reconstructive Surgery at UCLA Medical Center-Los Angeles County-Harbour. Dr. Siddiqui has been practicing in the Houston area since 2005 treating women 18 years and older and her primary clinical interests are pelvic floor disorders, urinary incontinence and pelvic organ prolapse. Dr. Siddiqui believes in personalized care and respectful treatment of each patient. She enjoys taking care of her patients and believes in providing compassionate care to women with various pelvic floor disorders. She is fluent in English, Hindi and Urdu. Dr. Siddiqui is married and the mother of two children. In her spare time she enjoys reading and traveling.